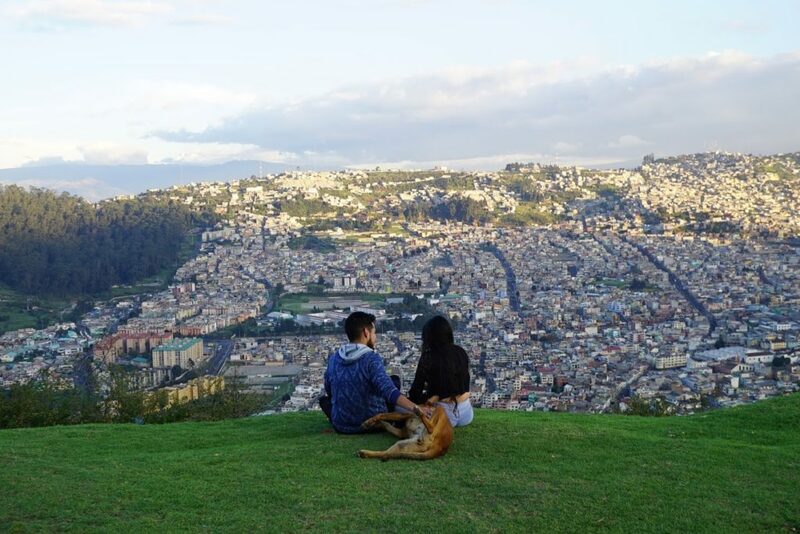 Looking back at Quito. Photo Joon Nam. Habitat III came to an end yesterday night. Since then, airplanes have, in clockwork 10-minute intervals, made Quito a little less cosmopolitan. The city will be lonelier, but the world will probably become a better place. This week I had the once-in-every-two-decades opportunity to attend the United Nations Conference on Housing and Sustainable Urban Development. 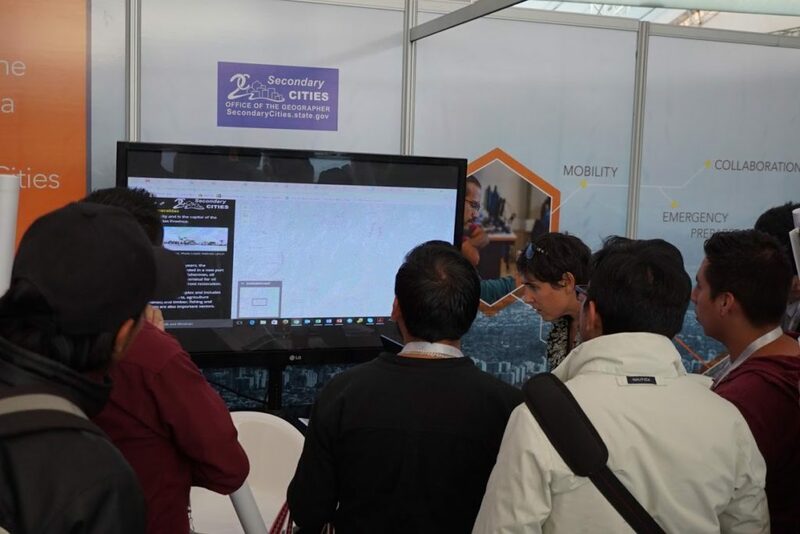 Specifically, I volunteered at booth 59 in section B of the exhibition area, a public-private partnership among the U.S. Department of State, Esri, and Ecocity Builders. For a week, members of B59 shared and discussed their experience and knowledge harnessing the power of data to create sustainable cities. And as a man of ink and pulp, I was naturally blown away. 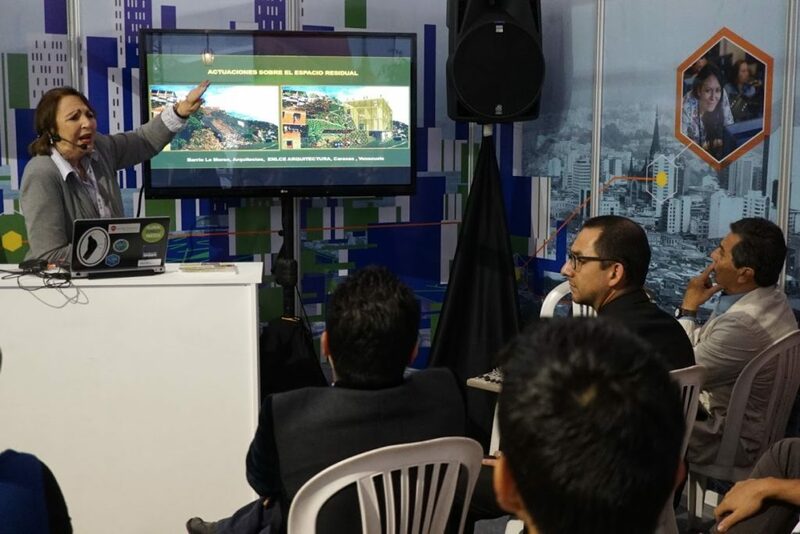 On Monday, Rosario Giusti de Pérez of Esri Venezuela showcased her work using GIS tools to transform urban planning in the slums of Caracas. Rosario’s toolsets and expertise allow her to make strategic use of the existing topography, respect and work with the community’s aesthetic values and social fabric, and optimize the provision of much needed yet limited public services. On Tuesday, Son V. Nghiem of NASA spoke to us from Vietnam. Using satellite-generated infographics, Son mapped the growth of the world’s megacities during the last decade, demonstrating the positive impact of air-pollution regulations in Beijing and the power of GIS to help policymakers reduce the risk of wildfires in California, protect groundwater resources in northern Italy, and reduce the prevalence of vector-borne diseases in Eastern India. Following Son’s presentation, Richard Resl and Nanki Wampankit of AmazonGISnet shared their experience mapping the territories of Ecuador’s indigenous nationalities. A map is one of many ways to describe a territory, and transcribing the oral tradition of different indigenous nationalities into communally created, GIS-generated maps has produced some of the richest, most polemic visuals. How do we reinterpret a geographical space overlapped by the ancestral territory of an indigenous nationality, the political delimitations of a sovereign state, and the government-granted economic rights of petrol-thirsty multinationals? On Wednesday, Carmelle Terborgh discussed Esri’s involvement in the creation of a water resources management platform for Colombia. Through a partnership between local and foreign institutions, a multidisciplinary team is using geospatial information to map out the country’s watersheds, basins, catchments, and overall water flows. Some of the expected results: resource conservation, climate change resilience, and optimal potable water distribution. And lastly, on Thursday, Sydney Moss of Ecocity Builders helped us understand the city as a living organism, displaying parallel images of translucent leaves and the road and water networks of urban centers. Sydney shared her experience mapping the urban metabolism of Cusco’s San Pedro neighborhood with a team of local students. After setting a roundtable to learn about the community’s greatest needs, the team gathered and analyzed information on the composition of the neighborhood’s solid waste stream, making data-informed policy recommendations on how to turn a municipal issue into an opportunity. 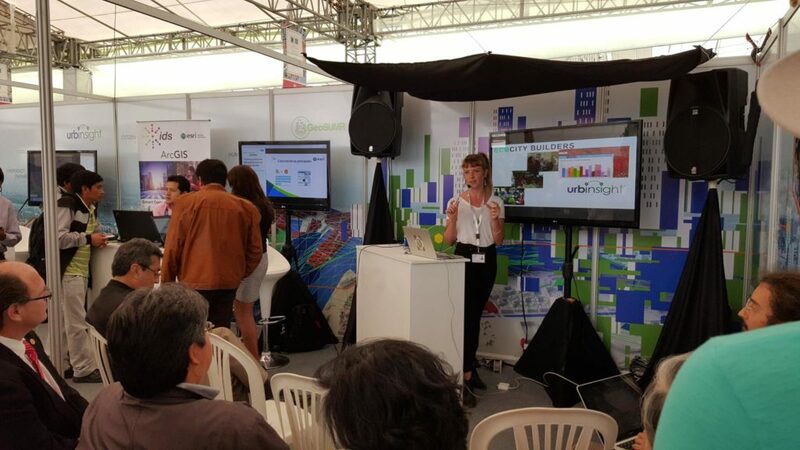 Sydney Moss helping to analyze collected data and samples in Cusco, and presenting Urbinsight at Booth B59. During these past seven days, I was given the chance to be an active member of booth B59’s privileged audience. After listening to over twenty presentations by avid tech innovators and social thinkers, I have drawn a few conclusions on the challenges and opportunities presented by the new paradigm on urban development and the use of data in the creation of sustainable cities. The urban/non-urban divide: we can trace the origins of species conservation to taxidermy and zoos. But it wasn’t until we began to think about the concepts of habitat and biosphere that we took significant strides in the right direction. As we look towards an urban future, let us not forget the non-urban. Disregarding the city will result in lung disease, vast inequality, urban squalor, and polluted natural resources. Likewise, ignoring the not-city might result in a food system characterized by biodiversity-thrashing monocrops and growth hormone-filled mystery meats, not to mention a severe detachment between humans and our source of nutrition, or a blatant disregard for the impacts of our rapidly increasing levels of consumption. Is a city of gold and marble in the midst of mines and leveled forests praiseworthy at all? Until we truly realize the vision of closed-loop cities – one that many at the conference referred to – we must think about our planet as a whole. And when we finally do realize that vision, we should still think holistically. Top-down and bottom-up urban planning and the use of both high-tech and local knowledge to understand and improve our cities: There is value in the work of experts and laypeople alike, and there is value in both satellite imaging and the stories of the oldest – perhaps tech-illiterate – human in the neighborhood. Public, private, and social parties, planners and users, all have a role in the creation of healthy and intelligent cities with healthy and intelligent citizenries. Our success will depend on exploring and making use of these synergies. Private and public ownership of information and technological assets: Let’s get over it… there are good reasons for and great value in both. A truly influential debate should address the context-dependent appropriateness of each. Making connections through the Office of the Geographer’s Secondary Cities interactive maps at Booth 59. Photo Joon Nam. I spent most of my time at booth B59, so despite being part of Habitat III for seven days, I missed 99% of what the conference had to offer. Nevertheless, I was able to stroll around the exhibition area occasionally and even got a chance to admire, among others, the German stand. Not only was the German stand the sturdiest and most appealing of all the displays I visited. It was, in addition, built entirely by rearranging the construction materials of four soon-to-be houses in the coastal region of Ecuador wrecked by the earthquake of April 2016. The display embodied exactly the kind of thinking that can take us forth throughout the 21st Century. Beyond the cleverness and practicality of the stand’s physical structure, the German delegation brought to the conference a series of important discussions, including the challenges and downfalls of urbanization – gated communities, waste generation, and exclusionary urban planning, among other topics. In a conference that celebrates global progress, national achievements, and the wits of a few famous individuals, it is easy to lose oneself in the novelty of technological innovation – which, admittedly, is sometimes novel indeed – and forget the reasons behind innovation: the serious economic, environmental, and social threats we face, or our constant determination to improve the human condition. After returning from the German stand feeling sober, I had a conversation with Shannon McElvaney, Community Development Industry Manager at Esri and leader of booth B59. We spoke about the elusive but also unquestionable impact of high-tech on the environment. Software comes from hardware. 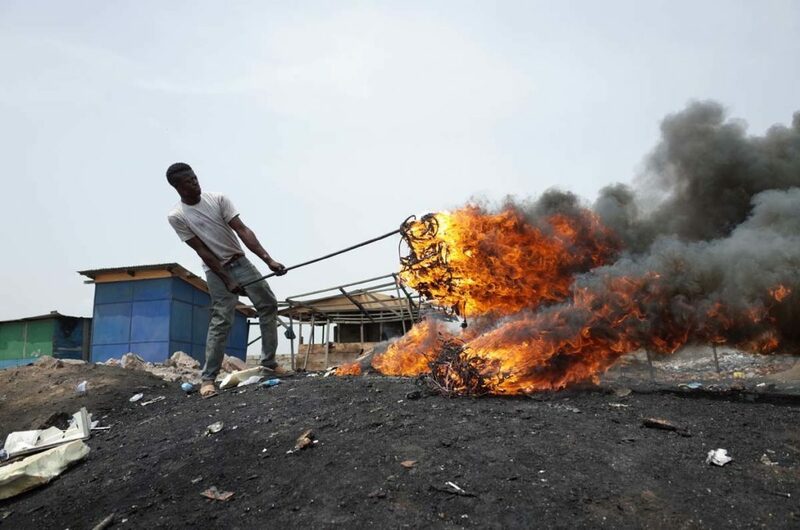 And hardware, when obsolete and improperly discarded, is toxic to the earth and its people. We spoke about how easy it was to forget that our world, even in an age of high-resolution satellite imaging and virtual reality, is and will always be physical. All developments in the cybernetic realm have a tangible counterpart, and we should take great care of both sides of the coin. Then there is the issue of speed. Despite the urgency of solving the world’s most pressing issues, and despite the addictive magnetism of modern cities’ entertainment opportunities, we must leave room to slow down and think – to be both pastoral and metropolitan. 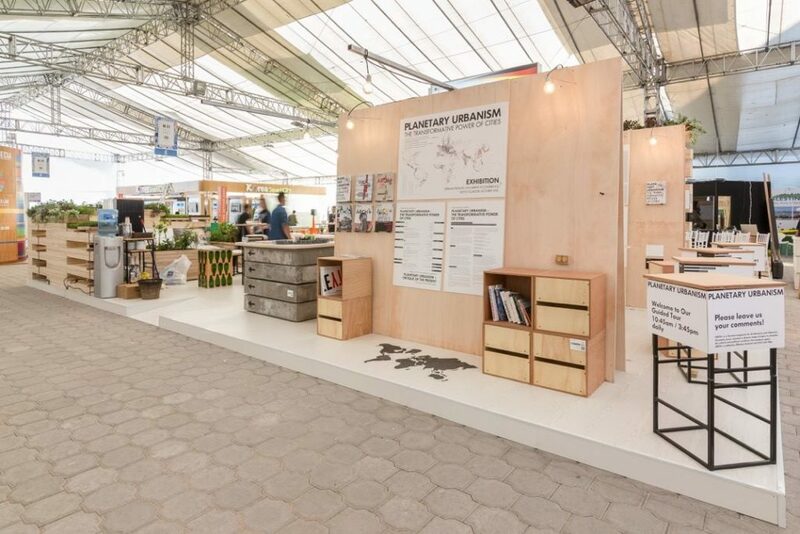 Despacio, the Colombian NGO at a nearby booth called attention to our urbanized future’s continuous acceleration. Will there be room for novels in the age of instant communication, or for oil paintings when we are bombarded every minute by computer-generated, semi-hypnotic images? Can we keep up with ourselves and innovate without forgetting our end goals? One of the greatest challenges of our urban future will be keeping our data in the cloud and, at the same time, our feet on the ground. Citizens keeping their feet on the ground in the streets of Quito. Photo Joon Nam. Habitat III has renewed my appreciation for my hometown of Quito: a city that despite being long and narrow does not have a skyline because it rests at the bottom of a deep mountain bowl. I left the HIII venue on Thursday afternoon and saw a sanguine sun set behind Volcán Pichincha’s two peaks: Wawa and Ruku, the child and the elder. 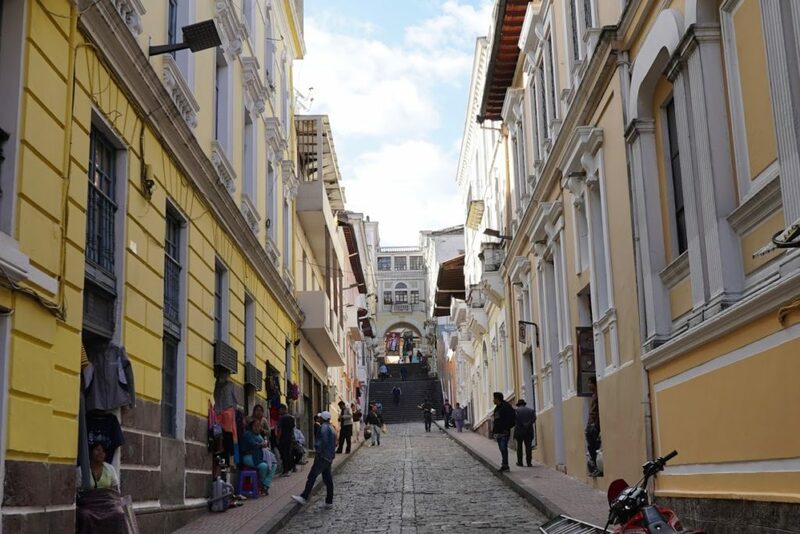 I then felt a fuzzy feeling while hanging from the open door of a jam-packed bus driving down a narrow road in the historic neighborhood of Guápulo. While enjoying the breeze of reckless locomotion, I thought about the New Urban Agenda. “Placemaking,” what I see as a constant urge to understand and appreciate the idiosyncrasies and complexities of the specific locations we each call home, is key to “sustainable development,” what I see as an unconditional effort to preserve and even regenerate the health and vitality of these dearest places. May we always keep in mind that each and every place on earth – urban or not – is that dearest somewhere for an unknown someone among us the billions. Before getting off the bus, I revisit one last time what I learned and pondered most at Habitat III. I begin to walk home, and as a security guard opens the door to the building’s concrete walkway, I think to myself that green areas and public spaces should be at the core of our newest paradigm on public policy and urban planning; not just because they are “green!” or “public!” Hopefully, they are and will continue to be daily reminders among our often synthetic and sometimes lonely modern habitats of where we have come from and what makes us human. 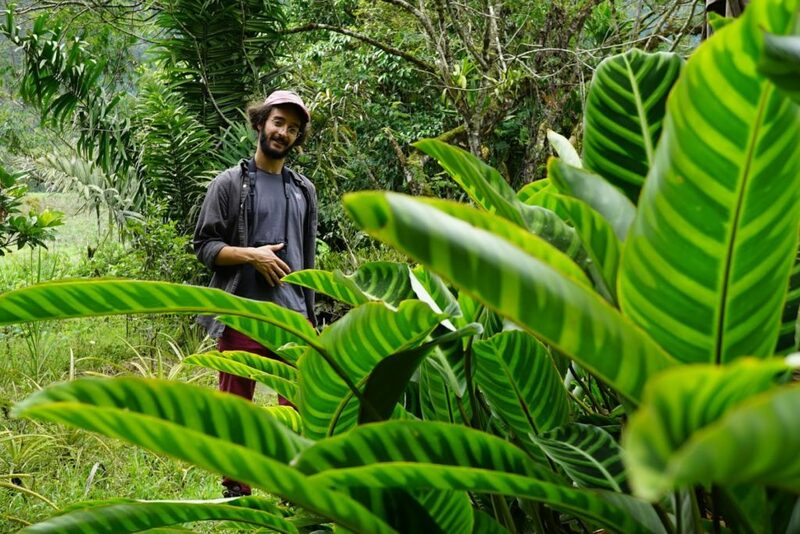 The author staying human and green on the outskirts of Quito. Photo Joon Nam. What’s going on at Both 59? Kirstin Miller with long time Ecocity Builders associate Shanta Lall Mulmi at Booth 59. 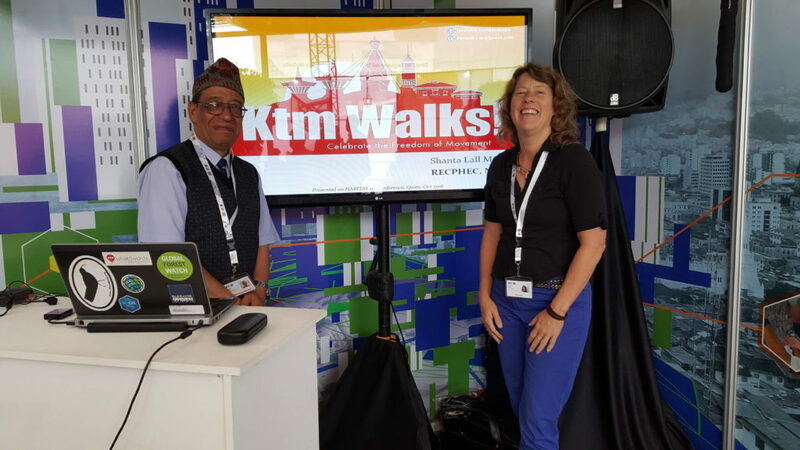 Shanta has been a driving force behind Katmandu Walks, an initiative organized by local communities in Kathmandu to increase the freedom of walking as a way to rebuild the city’s social fabric. Sydney describes the work of Ecocity Builders on Urban Metabolism Information Systems, tools and methods to describe the movement of resources – from source to sink – within a neighborhood or even an entire city. “The idea is to understand the city as an organism,” she explains while showing a slide comparing images of translucent dry leaves and the road and water networks of different urban centers. Sydney then shows the audience a Sankey diagram illustrating material flows for the city of San Francisco. Among its many areas of work, Ecocity Builders collects data to create these diagrams and other visualization tools – among them their Urbinsight GIS platform – and then uses these platforms to facilitate sound policymaking and grassroots decision-making. Sydney uses the example of Cusco to illustrate Ecocity Builder’s approach: EcB set up a roundtable to discuss with members of the community of San Pedro what they considered to be the neighborhood’s most urgent needs and trained students from a local university on the use of specific GIS platforms, including Urbinsight. Students then visited two of the neighborhood’s households per day for eleven days to collect data on the composition of each family’s solid waste. 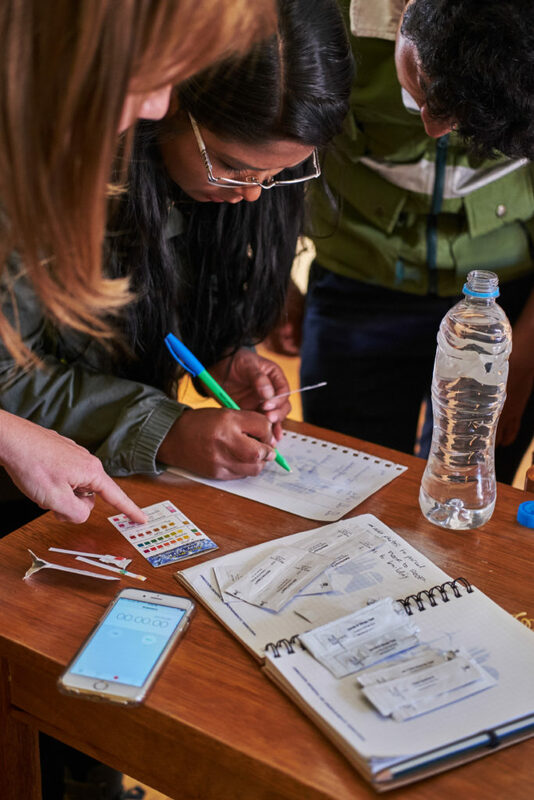 After entering all the data into a single spreadsheet and using metaflow software to create Sankey diagrams that map out the neighborhoods metabolism, the team analyzed the data and discovered that, on average, 50% of the neighborhood’s waste is organic. They then made policy recommendations based on the data. In the neighborhood of San Pedro, a composting project would strategically address one of the community’s greatest needs. There is a place in Porto Alegre where entrepreneurs, academics, programmers, urban planers, civil servants, and business leaders congregate to fuel innovation and sustainability in southern Brazil. Alexandre Santos is one of these people, and he shares with us his experience at ZISPoA, the Porto Alegre Sustainable Innovation Zone. Since its creation in 2015 as an initiative inspired in Noma, Washington, D.C., ZISPoA has been the setting of multiple courses, networking events, and festivals on sustainability and innovation. The zone is moving towards clean mobility and green energy generation in hope of becoming a scalable example for the rest of Porto Alegre and Brazil. Ideas thrive where ideas are shared, and ZISPoA is a regional hub to explore the synergies between innovation and sustainability. This week the Sweden+Brazil Innovation Weeks initiative begins. Will they be able to start an electric cab revolution in Porto Alegre and beyond?